I grew up as a lifelong vegetarian, so one could imagine my horror when I was told to dissect a frog in middle school. I was mortified. Though I loved science and knew it would be an interesting experience, I went to school that fateful day with hesitancy and sweaty palms. I was, thankfully, not among the many students who threw up or experienced anxiety attacks. I kept calm and did what I needed to do. Nonetheless, I went home saddened for the frogs. A few years later, people began talking about virtual reality technology that would allow students to dissect frogs, among many other things, on a computer. This technology is now making its way into classrooms, and may be coming to Salem-Keizer schools soon. On Monday, I used it to “dissect” animals. A California-based technology company, zSpace, visited Salem to inform local education leaders of a new opportunity for their students. Gary Murphy, a consultant for zSpace, gave a presentation to about 14 interested education leaders from Oregon, after which the participants had the chance to experiment with the technology. I put on the light-weight gray and black 3-D glasses and picked up the stylus, which is about as small as an ordinary pen but with buttons on it, and started exploring. It’s strange using a stylus that doesn’t have to touch the screen. The stylus transmits information wirelessly, and I could select which animals, organs, dinosaurs — you name it — I wanted to dissect out of dozens of options. And that was just one program. In another, I could have messed with the laws of physics or created electrical circuits. Considering my traumatic experience as a child, I wanted to look inside animals. I peeled back fur, skin, and muscles from the dog to see its skeleton. I enlarged organs to see what they looked like up close. I felt as if I needed to practice my dexterity to control the stylus, but knew I would be able to with practice. The human heart I dissected was colorful, pulsing. I could explore the veins, see where the blood was going. I kept wanting to reach out and touch the screen, if nothing else but to put my stylus on it, but I reminded myself I didn’t need to. Aside from trying out the technology, I learned a lot about the programs and company as well. 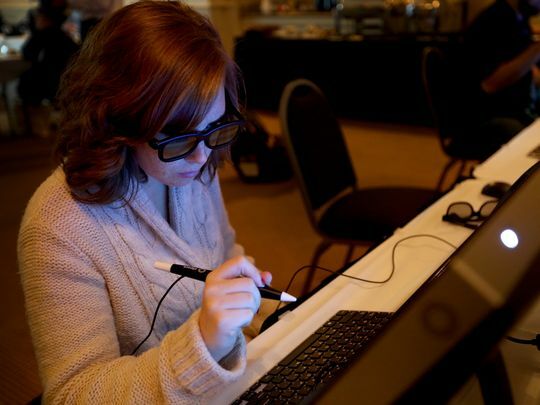 zSpace provides various virtual reality tools such as augmented glasses, fully immersive goggles, virtual reality CAVEs – or cave automatic virtual environments, and desktop virtual reality simulators. The desktops, Murphy said, are the best for collaboration, as the glasses and goggles, for instance, are used individually. zSpace technology is available in more than 250 schools across the country, in both K-12 and higher education institutions, and in more than 12 countries. Many schools create virtual reality labs, which vary by school in size and structure, but usually consist of at least one virtual reality desktop that multiple students can use at once and more groups can use throughout different classes. The price of these tools and the programs that accompany them varies, but they tend to range between one $250 payment for one system to $650 per system per year. Ron Kiser, a salesperson for zSpace, said many companies and agencies offer grants and financial aid for schools to purchase these programs. Though the systems can be expensive, they can help schools save on other resources. Additionally, the systems provide students with materials and lessons they wouldn’t otherwise have access to. Proponents also say that virtual reality gives students a deeper, more fun and interactive exposure to the subjects than a book can offer. According to Murphy, the programs are used for health career preparation, middle school science enrichment, engineering courses, helping students with special needs or English Language Learners, and other curriculum. Robbie Wheeling teaches all the high school sciences at Livingstone Adventist Academy in Salem. On Monday, he sat at a desktop, put on the glasses, picked up the stylus and began dissecting a human heart. He was able to hear the heart beating and feel it pulse in the stylus. It was his second time with the technology, but he said it had already advanced since he first tried it in March. Wheeling said the technology provides students the ability to manipulate things they wouldn’t have access to otherwise. For instance, students are able to dissect nonliving, pig hearts, but it isn’t the same, he said. Representatives from the Salem-Keizer School District were able to look at the technology today as well.